Above photo is of the Host that bled in Guadalajara, Jalisco, Mexico. July 24, 2013 - Reported in [Spirit Daily.com] also [here]. See/view video [here]. Below text from popery.org. 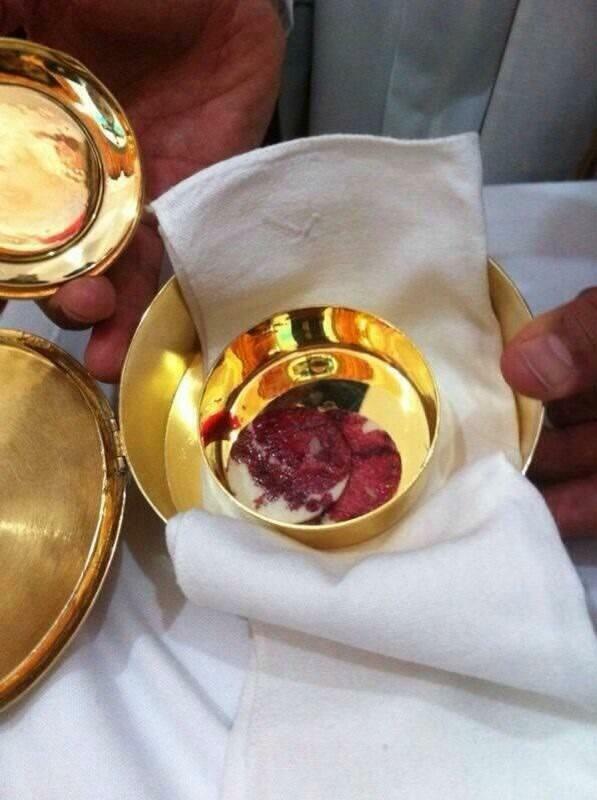 A Mexican priest is claiming that, after hearing the voice of God, the host which he had just consecrated began to bleed. The bloody host was available for adoration for some time, at which point the Archbishop ordered the Host to be reposed until further investigation. “This is a time of great blessing for this community and for the whole world.” says Father Jose Dolores Castellanos Gudino of the phenomenon that occurred in his parish yesterday after blood flowed from a consecrated host. Amid songs, clapping, tears, long lines and cell phones trying to capture the moment, thousands of faithful Catholics and non-believers alike visited the Parish of Mary Mother of the Church located in Colonia Jardines de la Paz (Guadalajara, Mexico) to witness the alleged miracle. “Chime the bells to summon everyone, pour out blessings to those who are present, and all day. Take your small tabernacle from private worship and bring it to the altar of the parish, place the largest monstrance next to it, and do not open the Tabernacle until three in the afternoon, no sooner, when I will perform a miracle in the Eucharist. The miracle to take place will be called the “Miracle of the Eucharist in the Incarnation of Love Joined With Our Mother and Queen,’ you will take the sign of which I speak, and you will display it.” Afterward, “the voice” told him to tell “the apostles” (the priests) to help all souls in their conversion and fill them with blessings. The ElInformador.com.mx adds: After the Mass, past 8:00 pm, Father Dolores Castelllanos’s secretary said he was unavailable to give an official statement, to say whether there had been contact with the Archdiocese of Guadalajara, or explain what would happen in the days after this incident. During the first day of public viewing of the “bleeding host,” the disorder in the church was apparent, to the extent that the parish authorities advised cancelling the exposition–at times it was only possible to focus on the yelling and pushing of adults and children who wanted to come to the altar and be witnesses to what Father “Lolo” had seen. The makeshift security guard of Mary Mother of the Church chose to place a screen on which were projected images of the “bloody host,” but over time this only served to further captivate those who had heard the rumor, like Mrs. Clara Aparicio, who appeared before the “Eucharistic Miracle” trusting that the asthma with which she suffered would disappear. “I did not doubt what I had heard so strongly, so clearly. Now I show it as I was told,” said the priest. At the stroke of 9:00 pm, the guards closed the doors to hundreds of worshipers leaving no opportunity to observe the “bloody wafer,” saying that the viewing would resume on Thursday at about 8 a.m.